Today air conditioners have become a necessity for us to avoid unbearable heat and unpleasant humidity. Air conditioners are of two types- window and split. The main difference between the two is: whereas a window AC has a single unit, a split AC has two units. Though a split AC looks aesthetically pleasing, it is far more complicated to install a split AC than a window AC. So, if you want to make a hassle-free installation of ACs, go for a window AC. In this page, we have listed the best 1.5-ton window Air Conditioners (suitable for medium sized rooms) available in India that you can invest without thinking twice. Voltas is a popular AC brand in India with a great after sales service network. It offers a decent quality product at the best price. The Voltas 1.5 183 CZP 3 Star Window Air Conditioner comes with a capacity of 1.5 ton that is suitable for rooms of 110-150 sq. feet. With a 3-star to 5- star rating, Voltas air conditioner gives you a decent power saving. With an anti-bacterial and Silver Nano filter, Voltas AC helps deliver fresh air to your bedroom and living room. Voltas air conditioner is equipped with self-diagnosis functionality that prompts you if there is anything wrong with the AC inner functionality. Hitachi 1.5 ton AC is a 3-star rated air conditioner by BEE which means it consumes less power compared to 1-star and 2-star AC. The model number of this particular AC is RAW318KUD. The condenser is made of copper which means this AC cools faster and lasts longer. The AC has a cooling capacity of 5100W and is suitable for a medium-sized room. 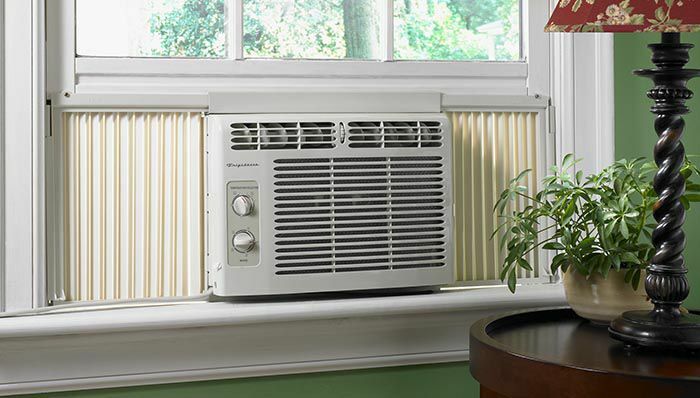 Hitachi window air conditioner comes with an Anti-bacterial and dust filter features. This Lloyd 1.5 ton window AC LW19A3N comes with a 3-star rating and has a cooling capacity of 4900W. It comes with an Auto-Restart feature that resets the temperature to the last set temperature after a power cut. To give comfort sleeping the AC comes with a Sleep mode that adjusts the temperature automatically while sleeping. Other features include Timer On/Off and an Anti-Bacterial and Dust Filter. The AC has a self-diagnosis feature that lets you know if there is an internal problem that requires maintenance. LG 1.5 ton LWA5GW3 Window AC comes with a 3-star BEE rating that consumes 0.96 units of electricity per hour. It comes with a Sleep mode that intelligently manages the cooling level based on the humidity level. It comes with a 1-year warranty for the product and a 4-year warranty for the compressor. LG offers two free servicing. The Carrier 1.5 ton 3 star AC (Copper, ESTRELLA PRO, and White) offers a display in the front to display temperature. The Carrier Midea Estrella Plus 1.5 Ton 3 Star Window Air Conditioner comes with useful features like Auto-Restart, Auto-Swing, Sleep mode, Smart diagnosis, and Timer. A unique feature of this air conditioner is the intelligent timer that ensures that the compressor gets a minimum off time of three minutes. Carrier offers a 1-year warranty on the complete unit and 5-year warranty on the compressor. We have listed the best 1.5-ton window air conditioners available at a decent price so that you can pick one as per your budget and cooling need.